Mine Hole Crag sits to the right of an old abandoned mine above and slightly west of Animal World. One might want to check the mine for any animal life before sitting down next to it to belay. The route list is 24 routes & growing. A. Slab, 8, 1p, 55', gear & bolts. B. Bolt To Crack To Bolts, 6, 1p, 55', bolts & gear. C. Bulge, 10, 1p, 55', gear & bolts. D. Lieback, 11-, 1p, 60', gear & bolts. 5.9 mix left side of roof obvious two bolts close together in roof. Left and uphill from actual mine holes. , ?, 1p, 65', gear & bolt. F. Firing Squad, 8- R, 1p, 60', gear, L of cave. G. Bolt To Crack To Bolt, 6, 1p, 40', bolts & gear. H. Thin Slab, 10-, 1p, 40', bolts +/- gear. I. What's Mine Is Yours, 9-, 1p, 35', bolts. Above cave. J. The Hot Donut, 8- R, 1p, 60', gear, above cave. K1. Couch Potato, 10-, 1p, 75', gear & bolts. K2. Sofa Kingdom, 8 to 9, 1p, bolts. R of mine. K3. Theen Crack, 9, 1p, bolts & small gear. K2 R to crack, roof on R.
L. Unknown Prow, 11-, 1p, bolts & gear, prow. M. Unknown, 10-, 1p, 100', bolts & gear, slab to flake. N? Unknown 11a, 11-, 1p, 90', bolts. O? Overlap, 10, 1p, bolts. P. Ruff Roof, 11+/12-, 1p, 100', bolts. Q. Just Another Cow's Climb, 10, 1p, 75', bolts & gear. R. Just Moo It, 10+/11-, 1p, 80', bolts & gear. S. Get Your Dieck Off My Barnyard Animals, 9, 1p, bolts & gear. T. Little Stevie's Favorite Heifer, 10+, 1p, bolts. U1. Bull Fight, 10 to 12-, 1p, bolts. U2. Sabrina's Choice, 8, 1p, 40', gear. V. Don't Pull On The Udder, 8- PG-13, 1p, 40', bolts & gear. W. Salisbury Steak Crack, 8, 1p, 40', gear. X. Cow Patty Crack, 9, 1p, 30', gear. FWIW, the obvious line over the small roof when you first reach the crag is Ruff Roof. Beware of rockfall in this area. 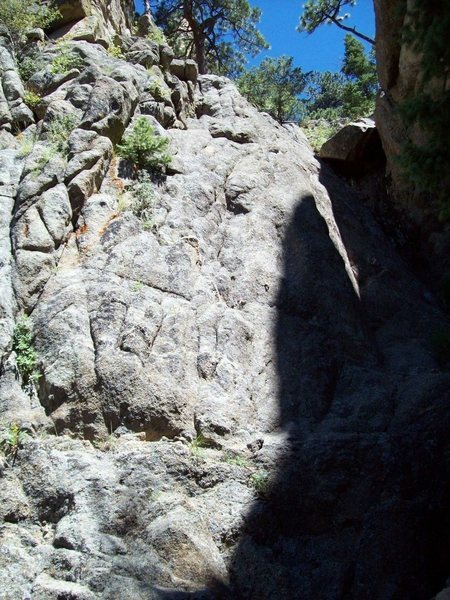 Mine Hole Crag is located about 8.5 miles up Boulder Canyon. Park at the same pullout used for the Boulderado or Animal World, on the left after the Narrows where the metal barriers end. Follow the trail on the left side of the Boulderado up the hill. 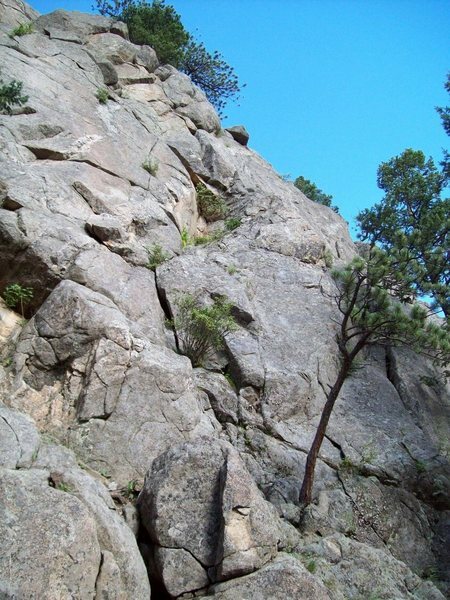 The trail branches off to the right, along the top of the Boulderado to the Animal World area. DO NOT take this right turn. Instead, continue up the trail skirting the rock band. The trail grows a little fainter but it's still easy to follow. Continue working up a loose gully and about 100 feet west you will eventually come upon the mine entrance and crag. About 12 feet in, the shorter right tunnel ends. 60 feet into the left tunnel, it ends. There are definitely other routes in that area - to the right of Ruff Roof (easily identified) there are at least five more lines, although the leftmost of that bunch appears to be unfinished. There are definitely more routes in the area now! There are four new mixed routes uphill and to the left of the actual mine holes. There are two routes just above and to the left of the mine holes. The obviously easy one on the left is mixed, There are three new routes on the crag that the Ruff Roof occupies. All of these routes are mixed except one and they are all still not adequately cleaned. Have at it though, bring your CCD SKILLS (COMPULSIVE CLEANING DISORDER) and have fun in the morning shade. Yee Ha!!!! Left and above Mine Hole 5.4 mixed and 5.9 4 bolts. 5.9 mix left side of roof obvious two bolts close together in roof. Left and uphill from actual mine holes. This is actually a picture of Cow Patty Crack. Mr. D'Antonio got it mixed up with Salisbury Steak Crack in his quality new guidebook. Salisbury is the obvious boulder problem handcrack through the bulge on the main face(facing westerly) and Cow Patty is around the corner to the right and up hill. Too bad they are both are not longer or they wold both be much more fun climbs!!! New routes right of Sofa. 1- Mixed 5.8 if you go to anchor for Ruff Roof or mixed 5.9+ if you go up crack above last bolt to chain anchor. 2= 5.9 Climbs bolted blunt prow right next to Knappy Crack (5.6) and left of tree on ledge to anchor for Ruff Roof. 3=Project right next to tree. Chris Archer got on it and thought it was 12a/b. Pull roof left of Ruff Roof step right and climb thin seam to ledge. Crosses Ruff Roof and up face to same anchor as Ruff?? 4= Project for me. Climb slab to flake right of Ruff Roof, pull roof and climb to chain anchor above. Not sure of grade. Still needs cleaning. 5= 10 feet right of this route. Nice 5.10 bolted route right next to tree stump. Climb fun techy terrain to bulgy crack and up to ledge and easier terrain to chain anchor. There are other routes in the area. They all are still a little dirty and in need of TLC. I will finish cleaning routes and update bolt and gear information as soon as I am able.Which will be soon as The Mine Hole works pretty good as a summer crag. 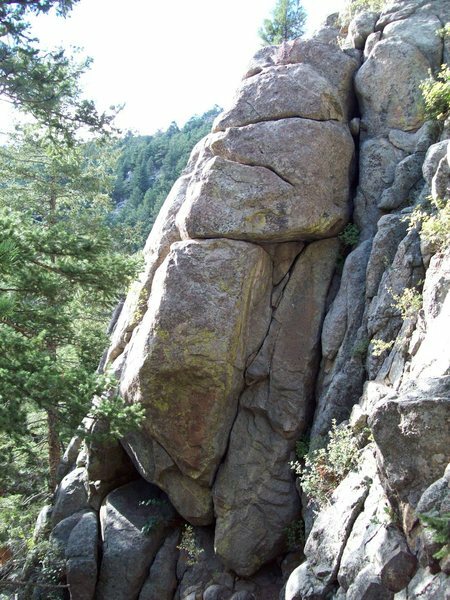 I have never felt as unsafe in Boulder Canyon from rockfall as I did in May 2012. 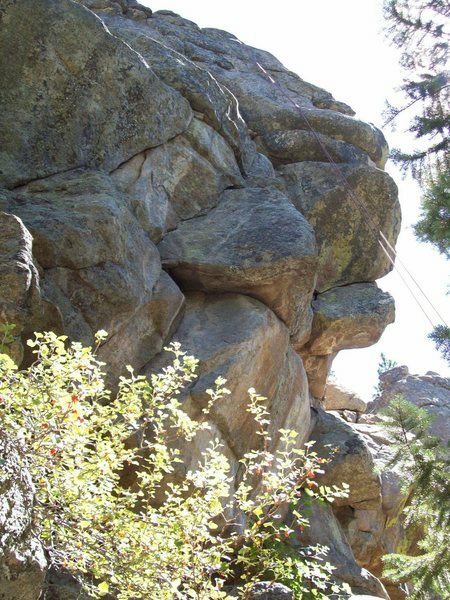 My partners, my dog & I were luckily climbing in the area of "Little Stevie's Favorite Heifer" when two big rocks came flying off the top of the crag about 50 feet left. We yelled up to warn whoever may have been above us of our presence but got no response. I quickly ran left to grab some of gear over by "Ruff Roof" when I witnessed a huge amount of big rock come raining down over the mine hole (left of the first rockfall) and bounce down the hill. Luckily, nobody was in its path, and no rocks made it to the road. I have climbed here on several times since 1998 when I established "Sofa Kingdom". I scrambled to the top of the crag to bolt that line, and it was fairly solid rock. I have never seen rockfall or felt it was a big concern until now. I don't believe it was natural rockfall, and somebody set it off. After moving everyone under a small overhang, I scrambled to the top to find the culprit but found no one. Lucky for them!